Ukraine crisis will keep Russia, US on tenterhooks! Ukraine crisis will keep Russia, US on tenterhooks! Yet, a major war is unlikely, suggest stars! Russia's so-called democratic way of annexing the autonomous republic of Crimea within the state of Ukraine (through a referendum in which the populace voted for breaking off from Ukraine and joining Russia) is being seen as the most serious political crisis, since the end of the Cold War between Russia and the US, which lasted from 1947 to 1991. Though political commentators are unable to figure out what the repercussions of this could be, they agree that it could turn out to be an extremely nasty and prolonged East-West conflict. The holistic picture is still very hazy, but Ganesha, with the help of Vedic astrology, tries to deconstruct the issue. The current transit of Saturn-Rahu and Mars in the 10th House of Ukraine's country chart is an indicator of the escalating violence, frustration, anger and brutality in the country. Ukraine, as per the chart, is passing through Jupiter Mahadasha and Jupiter Bhukti. Jupiter is the Lord of the 3rd House (neighbouring countries) and 12th House (secret enemies) in this chart. This planetary alignment clearly indicates a fearful time for the nation and a strained relationship with a neighbouring country – which in this case is Russia. Russia itself, as per Astrology, is currently under the influence of Rahu-Mercury period. Rahu is in the 5th House in Russia's Chart with Moon and a retrograde Saturn and in Taurus Navmansa. Mercury is the Lord of 10th House and is posited in the 5th House from Dashanath Rahu. So, it is likely that Russia would be willing to take aggressive steps and reassert influence over its bordering nations. The transiting Saturn-Rahu and Mars in square with the natal Moon-Saturn and Rahu further indicate a steady and confrontational build-up of military power, which is not likely to recede over the next few weeks. Vladimir Putin's Presidency chart also indicates that he is not going to calm down easily. However, the stars may not relent; and, all may not really go Putin's way. In fact, he himself shall be feeling pressurised by now, where the situation has entered a phase where there is little room for meaningful negotiations. The United States and Europe may be trying to prevent President Putin from making advances elsewhere in the former Soviet republic. 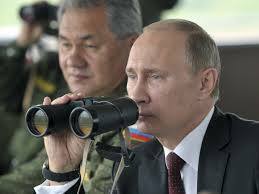 Russia, however, will remain firm and is unlikely to pull back its forces from the Crimean peninsula, suggest the stars. Last, but not the least – if we look at the overall picture of the world - the period between March and July 2014 looks set to be highly fractious and unsettling. All in all, even though the world may be prone to revolutions, confrontations and internal civil wars during this time, an outright super-power versus super-power war is unlikely.